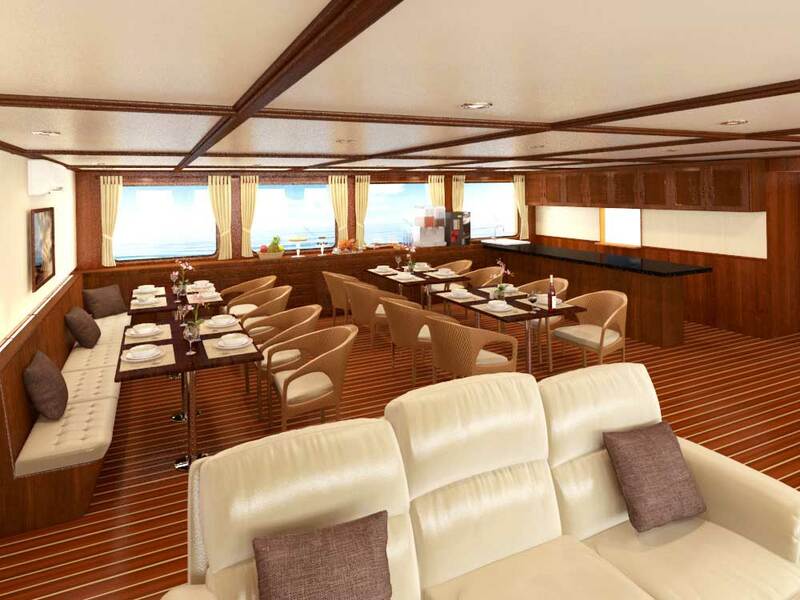 Blue Manta is probably the most comfortable & luxurious purpose-built diving ship in Indonesia. 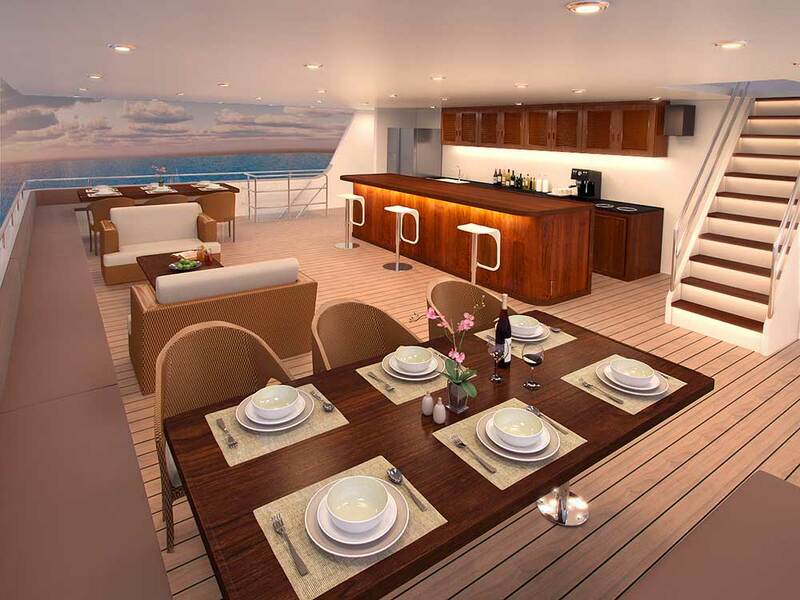 Brand-new in 2015, the boat is 45 metres in length, and normally takes no more than 18 guests. 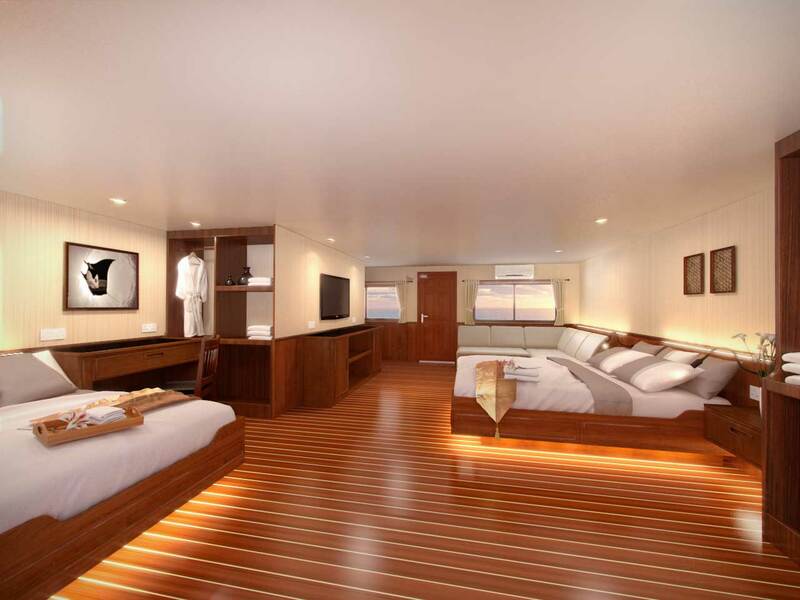 Every cabin is fully air conditioned and has an en suite bathroom. 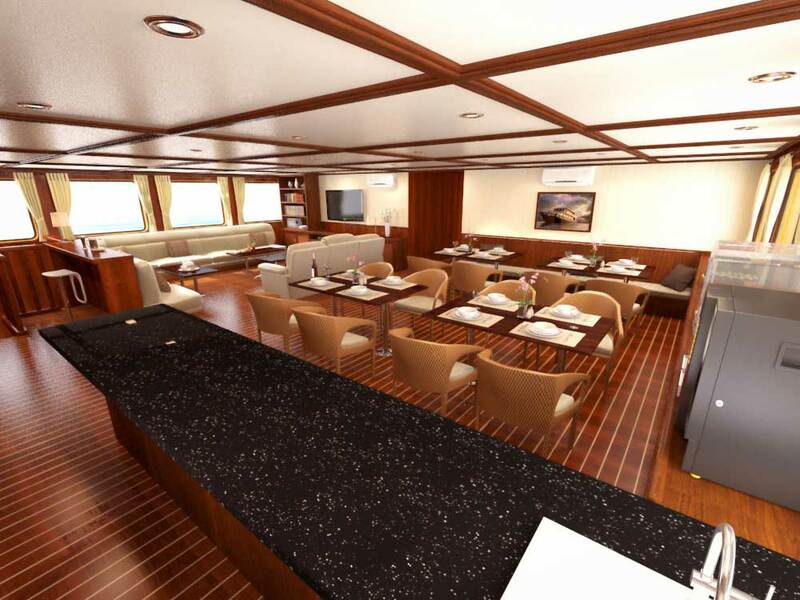 There are air-conditioned lounge & dining areas, as well as plenty of places to relax in the sea breeze, either in the shade or sun. 24-hour Wi-Fi is available, and there is an on-board massage service. Sometimes the luxury is so nice that it’s an effort to jump in the water and go diving. But considering the diving locations that Blue Manta visits, this feeling doesn’t last long. Blue Manta's trips visit the very best diving locations in Indonesia. These include Komodo, Raja Ampat, Ambon, Banda Islands, Alor, the Forgotten Islands, and more. The diving is what guests come for, and the areas visited ensure wonderful underwater experiences. 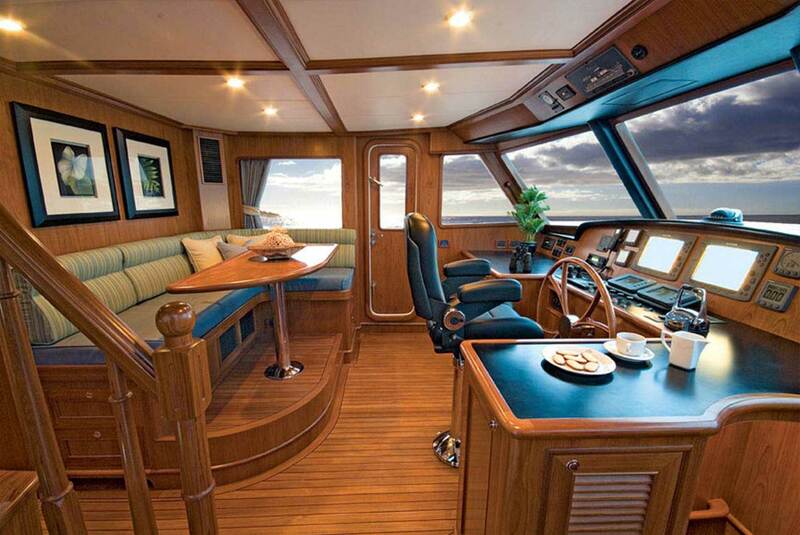 The boat's cruising speed, size & steel hull mean that crossing seas is easy and always comfortable. Three motorized (90hp) tender dinghies ensure that divers never have to wait long to return to the main boat. 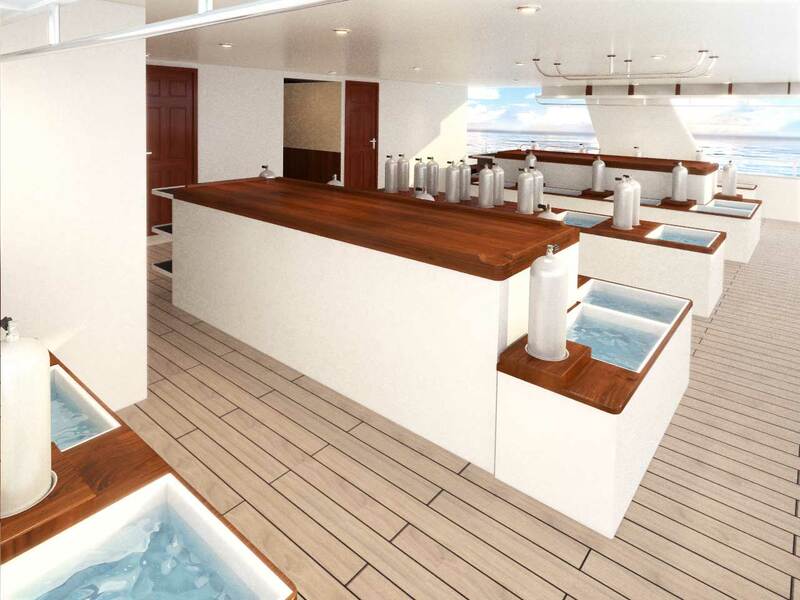 To ensure that all the guests on board each Blue Manta diving cruise can enjoy the cabin of their choice and space and privacy at all times, there is a selection of 14 cabins on three different decks. 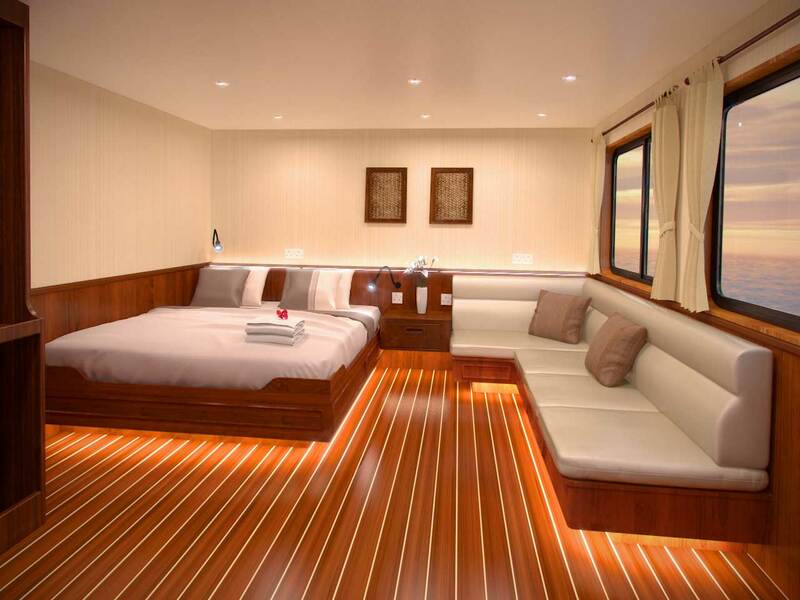 However, the team never fill all cabins on scheduled trips. Unless a full charter booking, just 18-22 guests join scheduled trips, and they are served and supprted by a team of 20 crew & dive staff. 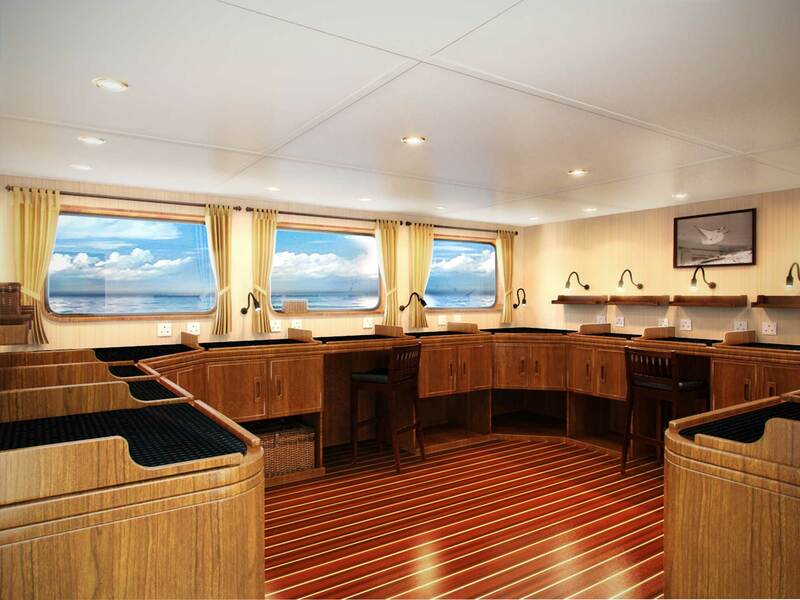 In addition to comfortable cabins and social areas, there is a room dedicated to photo & video equipment storage and cleaning, with enough stations for everyone. Plus individual rinse tanks for each diving guest. Most of Blue Manta’s trips are just over a week long, and are always at the right place during each month of the diving season. There is no place in Indonesia that Blue Manta can’t reach and allow its guests to enjoy diving at. 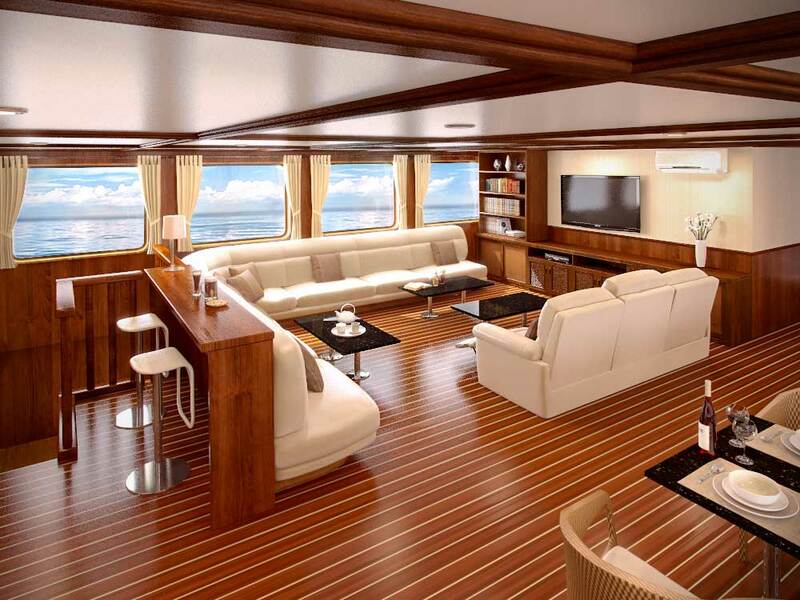 The size of the boat not only allows guests to relax in comfort, it cruises at 10 knots and is 9 metres wide & weighs 400 tons. 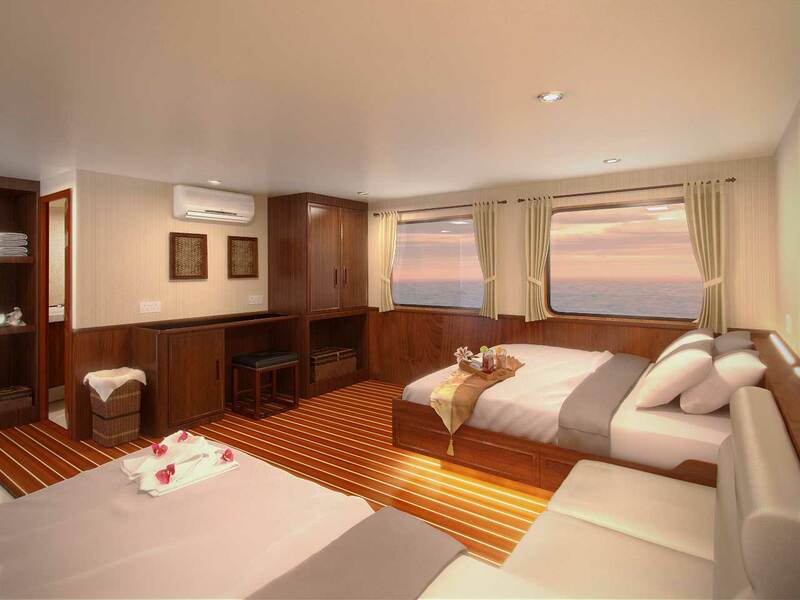 This boat is truly the most wonderful vessel to enjoy Indonesia’s best diving areas. Trips are regularly sold out months or more than a year ahead, so advanced booking is essential. 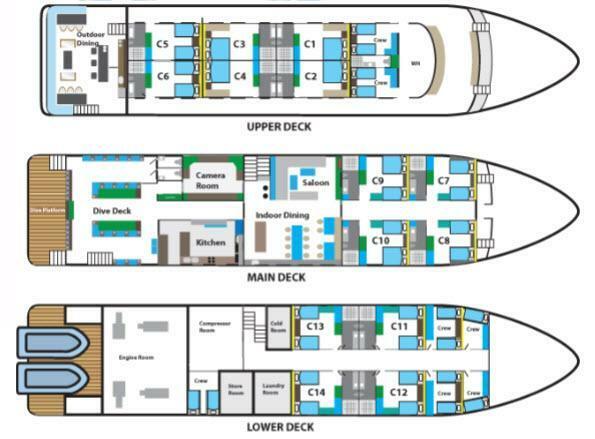 Blue Manta has a wide range of trips with separate itineraries. In order to give the best information possible, we have listed as many as we can. Please scroll down to find the itinerary for your chosen trip. The list is constantly evolving, so please contact us to ask any questions or for a detailed itinerary for a trip you can't see. Most trips depart in the afternoon and return at night. 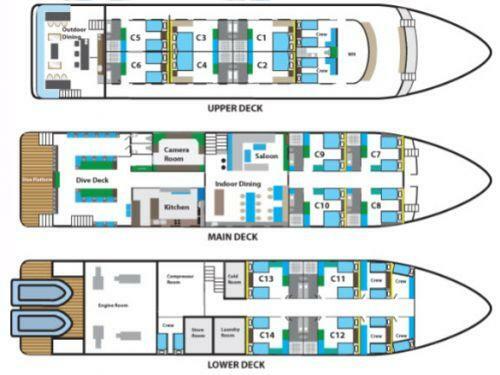 This means guests may do 0-2 dives on the first day, and disembark after breakfast on the final day. 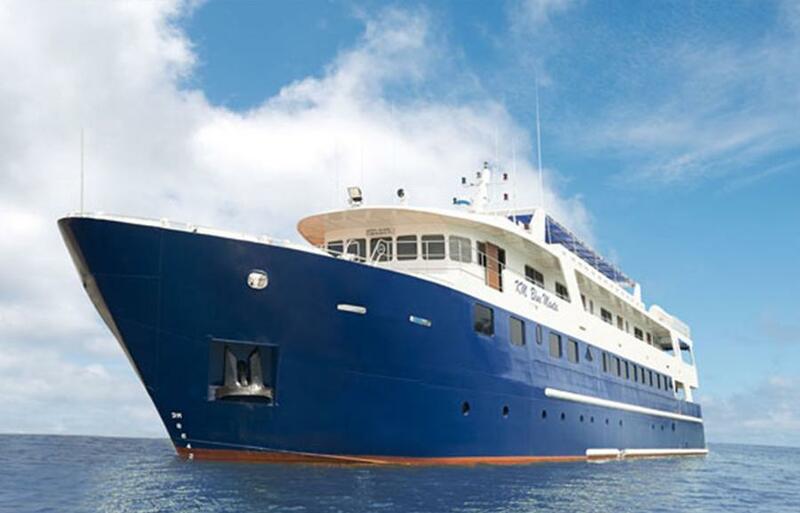 PADI diving courses are commonly taught on liveaboard cruises around the world, and Blue Manta is no different. The diving staff are qualified professionals, and many PADI diving course are available. These include the most popular courses of PADI Advanced Open Water Diver (AOW), Rescue Diver, Enriched Air (Nitrox) Diver and with some preparation, it’s also usually possible to learn to dive on Blue Manta, by taking your Open Water Diver course. 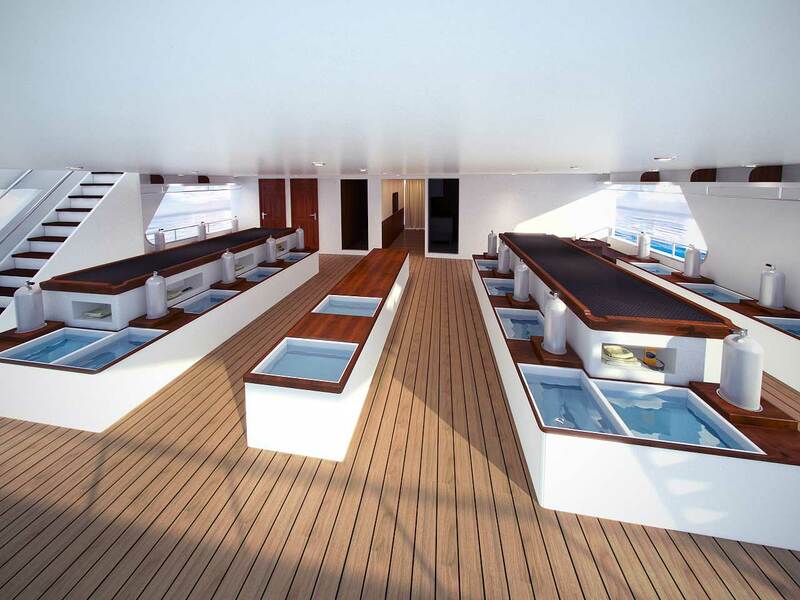 Please contact us in advance to let us know your needs or interests in taking part in a diving course on KM Blue Manta. Please inform us as soon as possible if you are interested in taking a PADI course on Blue Manta, even if you haven't decided for sure yet. Knowing early enables us to give the best advice and prepare the materials and staff in your chosen language. Blue Manta departs from several different ports and piers around Indonesia. In almost all cases, the staff will collect guests from the nearest airport or local hotels & resorts, free of charge. Then, at the end of the cruise, transfer them to their chosen hotel or local airport. Don't worry about the 24-hour 'no fly time' because the trip itineraries are carefully planned to enable guests to enjoy the final dive of the cruise and board the most commonly taken flight the following day. Please choose and confirm your Blue Manta trip before your book your flights within Indonesia. In addition, some overseas credit cards are difficult or impossible to use for booking domestic Indonesia flights online. And if you do succeed, most airlines want to see the actual credit card used when you check in. Often, the best procedure is to ask us to put you in touch with our local agent, who is efficient and trustworthy, and books most of our Blue Manta & Raja Manta guests' flights. 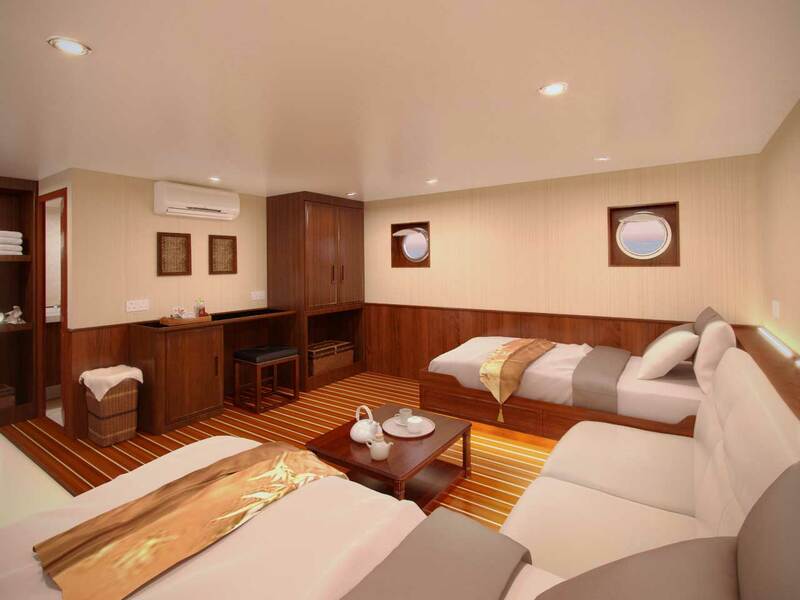 The published rates are inclusive of full-board accommodation on Blue Manta for the duration of the trip. 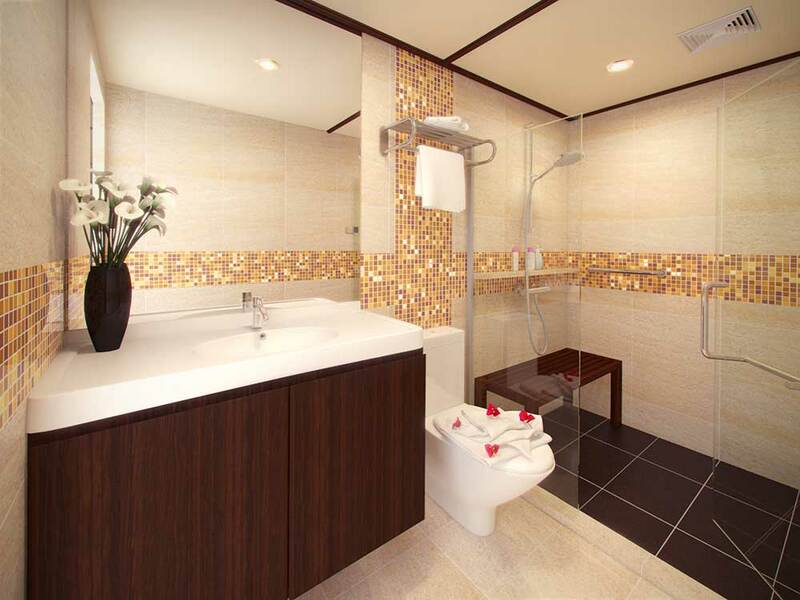 This includes cabin & laundry services, toiletries, all meals and most non-alcoholic drinks. Divermaster guide services, weightbelts & weights, and 12 litre tanks are also included. Scheduled transfers from local airports and hotels are free of charge, too. Extra costs for every guest are the national marine park entry and diving fees, which vary depending on the length and destination of each cruise. These average $100-250US per trip. 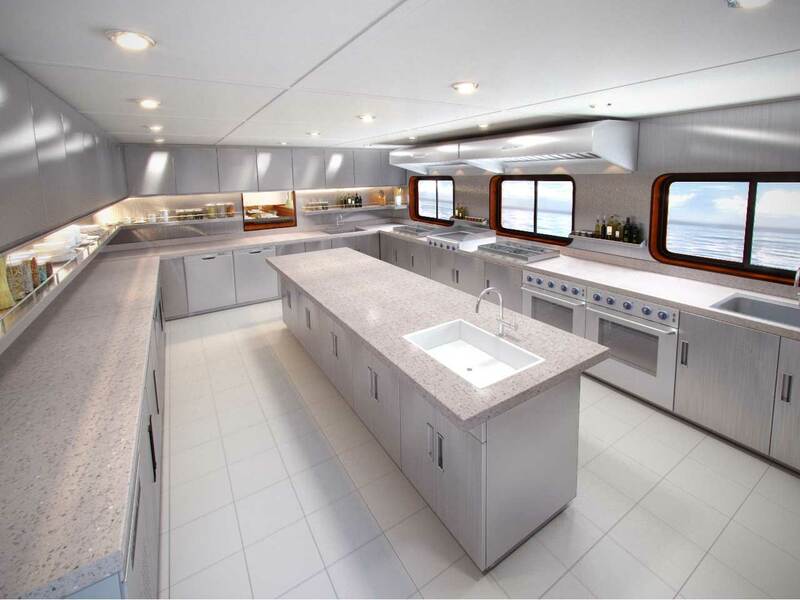 On-board massage, alcoholic drinks, Nespresso coffee, Nitrox fills, 15 litre tanks, and diving equipment are available at reasonable rates. Diving insurance on Blue Manta is compulsory. If you need assitance, please contact us. We also thoroughly recommend travel insurance, in order to protect you in the event of missing a flight or connection. Please contact us with questions about any other extra fees, such as park entry, fuel surcharges, tips, equipment hire or anything at all.